Provide comfort for the family of Ella Pribble with a meaningful gesture of sympathy. Ella Dates Pribble, 95, passed away Thursday, November 29, 2018. 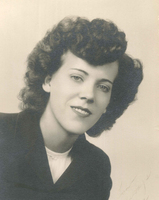 Born October 17, 1923 in Ulysses, PA, she was the daughter of the late Nancy Bunnell Dates Fetzer and Archie Dates. During World War II, Ella wired the radio boxes and landing gear for P-37 aircraft in Niagara Falls, NY. After the war, she married and moved to Kentucky where she worked at the Bluegrass Army Depot (AVON) for several years before having her children. She was retired from Johnson Controls. Ella loved doing all kinds of crafts; she read voraciously; and made the best fried chicken, sugar molasses cookies and bourbon balls - to name just a few family favorites. She painted beautiful ceramics that are family heirlooms. She loved to sew and was better than any professional seamstress - from buttons to tailored suits and prom dresses. Recently, she spent hours coloring lovely pictures that she gave to family, friends and others who needed a bit of cheerfulness in their day. Ella is survived by her daughter, Nancy (Scott) Soucek; sons, John (Carla) Pribble and Tom C. Pribble; three grandsons and three great grandchildren; as well as numerous nieces and nephews. She is also survived by special lifelong friends, Alma Marshall, Annie McQuillen and Gail Figgs; and her sisters-in-law, Mary Pribble and Betty Pribble. In addition to her parents, she is preceded in death by her step-father, Fred Fetzer; brothers, Hugh, Milton, Lester and Albert Dates. The Pribble family is very grateful to the staff at Dover Manor for their loving care they gave Ella. A memorial service will be held at 4 PM on Friday, December 7, 2018 at Johnson’s Funeral Home. Visitation will begin at 2 PM until service time. In lieu of flowers, memorials may be to Bluegrass Hospice Care, 1317 US-62, Cynthiana, KY 41031. To plant a memorial tree in honor of Ella D Pribble, please visit our Heartfelt Sympathies Store. My condolences for the death of your dearly loved Mrs. Pribble. The Creator also feels the loss (Ezekiel 18:32). But He has wonderful plans for her future. Acts 24:15 and Job 33:25 promise her return to life perfectly healthy. Psalm 37:11, 29 and Revelation 21:3-5 give h.. the hope of life everlasting in enjoyable surroundings. Jesus himself taught us to pray for that marvelous time at Matthew 6:9-10. He Who promises cannot lie (Isaiah 55:10-11; Titus 1:2). JW.ORG has been directing me to more related verses so my hope in that bright future may remain strong. It is my sincere wish that it will benefit you as well. May the peace of God be with all of you (Philippians 4:6-7; Hosea 13:14). Nancy, John and Tom, I remember your Mom with fondness. Thoughts and prayers to you all.